Do not be afraid. According to the Vatican’s top astronomer, the world isn’t going to end on December 21, despite fears and claims to the contrary inside and outside the Church. We don’t follow the Mayan Calendar; we follow the Gregorian calendar. We are Roman Catholics and life in the Church centers on the Vatican. We follow the direction of the Supreme Pontiff whom we believe is the definitive leader, the Vicar of Christ on earth. Right now that leader is Benedict XVI. Nearly eight years into his pontificate, he continues toto disprove his detractors and prove to the worldthat he is the leader we need in the Church and in the world of in the year 2012. Our Lady of Guadalupe is the Patroness of the Americas because she helped to evangelize the New World. She appeared to Juan Diego in sixteenth-century Mexico and her words to Juan broke through to his people who accepted Christ in large measure, though they originally resisted the efforts of the missionaries. Through the preaching of the priests in Mexico, some were converted to the faith, but not enough. By and large the natives remained so obstinate that the bishop of Mexico believed that the cause was hopeless, that the Mexican peoples would not receive Christ as their Savior. They were ready to give up and go back to Europe. Now, four centuries later, the message of Guadalupe has shaped Catholicism in America by the Word of the Lord spoken by Mary through Juan. The message that Mary gave Juan did not end with him in Mexico long ago. Today ours is a continuing role in the missionary mystery of God’s only Church in a world as hostile and filled with detractors as was Juan’s world before Mary showed herself as the most faithful and persuasive advocate of her Son. Once Mary appeared to Juan, the fortunes of the missionaries changed. How much greater is the resistance of the pagans in this new, new world. Everywhere we go there is opposition to the faith, from those who do not know Christ, from those who do know him but are ashamed for their faith. Mary gave Juan the message of salvation because she knew that he could help the priests to convert his people. Because of this, many thousands of converts were baptized day after day and the nation of Mexico became a stronghold for the Catholic Church. When Mary appeared to Juan in 1531 she brought the message of conversion to a new wilderness generation. The Word of God as shared with Juan and his people drew many souls to find salvation through Baptism and the forgiveness of sins and a new life in Christ Jesus the Savior of humanity and the promise offered to a new race of people, Juan’s people, the Aztecs, proud pagans who knew nothing of the one, one, true, and eternal God. Faith in God is not something to be kept secret. Juan Diego shared the message of Mary with his people because he was a unique vessel of God’s grace. Mary humbled herself by asking for Juan’s help. She enlisted the saint to aid her in evangelizing his people after they had resisted vigorously the efforts of the Catholic missionaries to Christianize them. Today the Word of God continues to be proclaimed with power and precision through a new form of communication: cyberspace. The technology that we have crafted to aid ourselves in our triumphs and our struggles has cost humanity part of its soul. History has demonstrated that technology also has the capacity to help man commit great evil. Wars, genocide, and tyranny in all forms exist today by the push of a button and allow the great evil of this world to suppress man’s soul and leave him in a continual state of darkness and unrest. Despite its evil uses and the love of technology to the point of veneration — some even worship science — it has the potential for great good. There is great light in the inventions and wisdom of God as expressed in mankind. The Lord permitted us to use our reason to understand him greatly through faith. Someone who demonstrates this very well is Benedict XVI our pope. The pope made history again today in Italy, when, about twelve hours ago (as of this writing), he tweeted his first tweet on Twitter. This social media outlet allows one to post his thoughts and feelings and emotions, commentaries, pearls of wisdom, and advice to the anyone around the world. 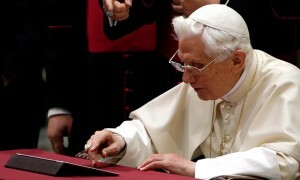 Benedict has long been a proponent of using technology for the purpose of evangelization. As somebody whose life has spanned the twentieth century, he sees its potential to proclaim the Word of God like nothing before. When Benedict was a young priest, a computer filled an entire room. Today, toward the end of his time with us, a computer that fits in the palm of your hand — and is ten times more powerful than its electronic ancestor — can change the world. In the Year of Faith which commemorates the 50th Anniversary of the Second Vatican Council and the 20th Anniversary of the Catechism of the Catholic Church, bishops, priests, deacons, all the lay faithful, and now even the pope can make use of technology to evangelize. Social media is a useful starting point for encouraging the reading of the Bible and the Second Vatican Council documents. The Word of God can be proclaimed with a blog post, a tweet, or on Facebook, empowering the hearer to become a preacher to cyberspace, a new frontier. Mary used a unique way to reach new converts in a hostile environment. She knew what to say and who to say it to and Juan Diego carried the message to his people and the Word of God was proclaimed and the people of God grew strong and increased in numbers. This is Catholicism: billions and billions saved.